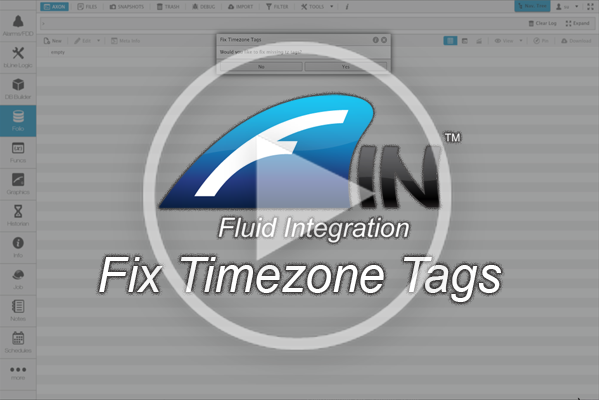 This week we feature a cool and easy way to update timezone tags across an entire FIN Stack database with just 1 click of the mouse. Let's say you have several points missing the 'tz' tag, fixing that manually could take quite a while. To help users blow through this process as quickly as possible, we've created the Fix Timezone Tags tool. By utilizing the "Fix Timezone Tags" tool, users can clean up the entire database in seconds! Simply fire up the tool, and hit apply. The tool will automatically go in and add the correct 'tz' tag and info to all of the points that are missing it! The timezone tag and info automatically syncs with the timezone set on the points' Site.